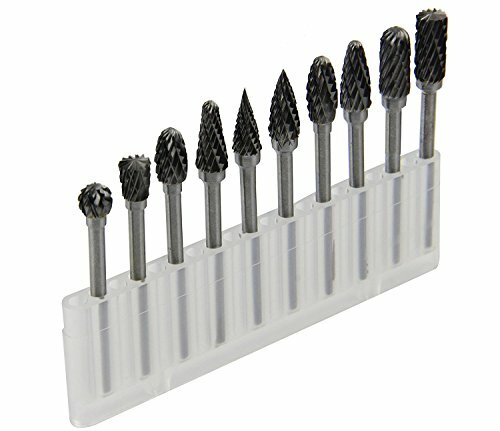 SE is proud to bring you this professional assortment of 30-Piece Set of Titanium-Coated Diamond Burrs, Grits 120-150. It is great for filing brick, ceramics, fiberglass, glass, gold, metal, plastic, platinum, rock carbide, silver, stone, tile, wood, and anything with a hard surface. 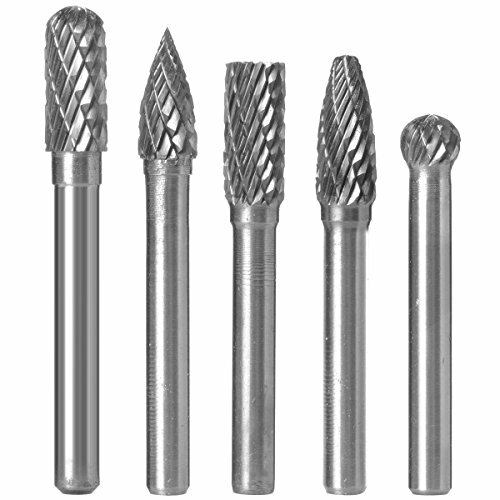 It is recommended to use water as a lubricant when using these burrs. 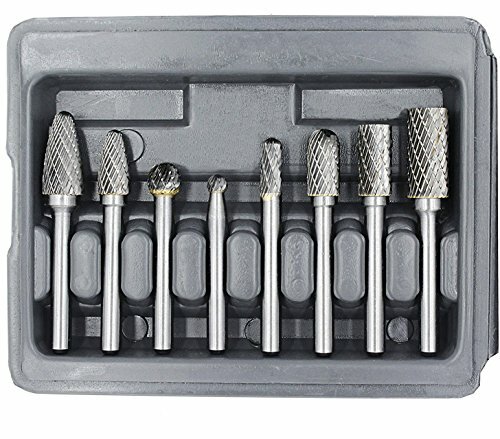 All burrs in this set have a shank size of " (3 mm), allowing them to be compatible with most die grinders and rotary tools as you finish, grind, and shape your work with precision. When the job or project is complete, you will be happy to place your burrs back into the compact storage case so you can organize, store, and transport this set for future use. SE products are quality items for extremely reasonable prices. SE is committed to providing the customer with the best source for value possible on the market. 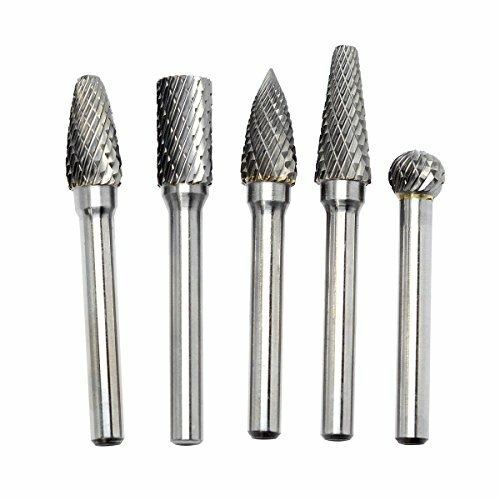 You will enjoy the quality, function and usefulness this SE 82331TF 30-Piece Set of Titanium-Coated Diamond Burrs, Grits 120-150 has to offer. Wide Range of uses | include Body Shops, Fabrication Shops, Brake Shops, Industrial Shops, Die Manufacturers. You can use the SE DT220R Diamond Burr Set (20 PC.) for etching, fast cutting, filing, grinding, sanding, and shaping with detail and precision. You can use this on brick, ceramics, fiberglass, glass, gold, hardened steel, marble, metal, plastic, platinum, rock carbide, silver, stone, tile, wood, fiberglass, and any solid surface. 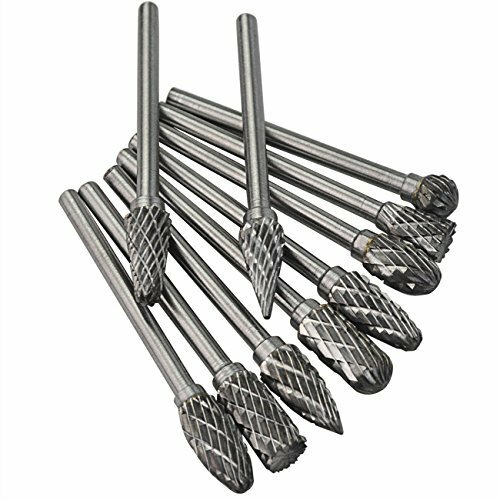 All burrs in this set have a 1/8 shank diameter size, which allows them to be compatible with most die grinder and rotary tools. The burr shapes include ball, cone, cylinder, and more. This set is ideal for craftsmen, hobbyists, jewelers, modelers, repairers, and more. They are 1-3/4 long and made of GR-2 quality diamond. A clear plastic storage case, which is included, provides convenient organization and storage of your burrs for future use. Warning for California Users: Pursuant to California Health & Safety Code Section 25249.6, the distribution of this product warns you that this product may contain substances known to the State of California to cause cancer and/or reproductive toxicity. Warning: Using power tools can be dangerous. Always take care and keep away from children. Wear protective eyewear in work area at all times. Select correct type and size of power tools for work. SE is committed to providing the customer with the best source for value possible on the market. 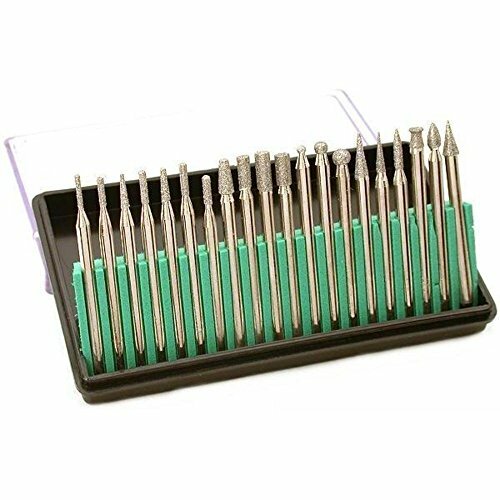 You will enjoy the quality, function and usefulness of our SE DT220R Diamond Burr Set (20 PC.). 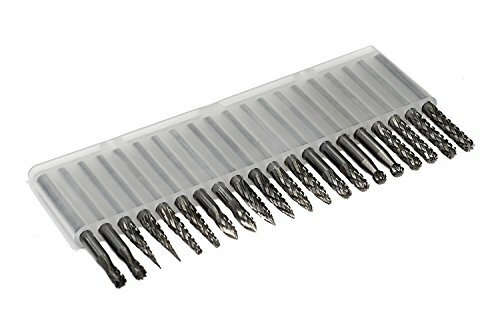 This 10-piece double cut carbide rotary bit set with 3mm shank cuts through metal with very little effort. Ideal for cleaning up welds, grinding weld beads, shaping parts, smoothing rough castings, or porting cylinder heads. Vast application in body shops, fabrication shops, brake shops, industrial shops, die manufacturers, and more. shank diameter:3mm(0.118 Inch) Cutter pattern: double cut Material : tungsten carbide pakaging : a nice transparen plastic caset Set includes: SA, SC,SD ,SE,SG,SF,SL,SM and SN type burrs. 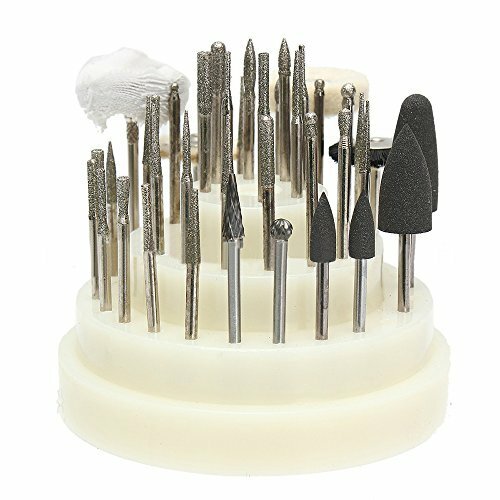 SF-5: Tree shaped radius end 1/2" x 1"-1/4"
The carbide burr set tool fits most small rotary tools,die grinders,for woodworking drilling carving engraving milling porting. Made of heat-treated tungsten carbide material,sintered and machined from 100% new raw tungsten carbide. Unique tooth angle prevents chipping for the longest lasting design possible. 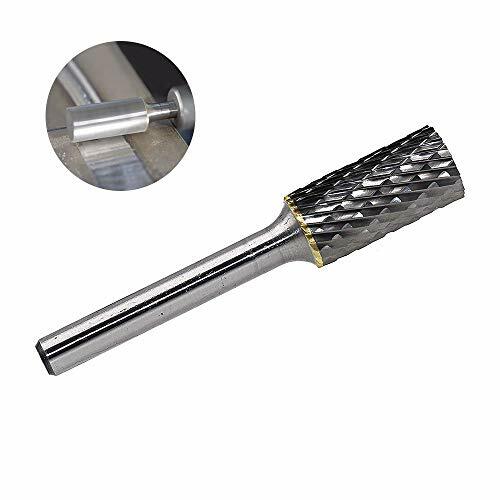 Used for metal working in mold and pattern making, die sinking, surface cleaning and maintenance,perfect for opening holes, or porting heads on ferrous materials. 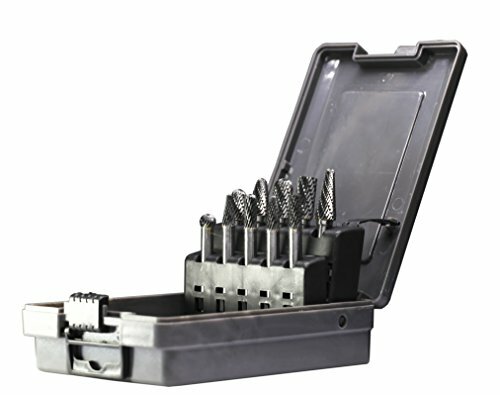 8-piece double cut carbide rotary file burr set,Includes SA, SC, SD and SF type burrs. Specification: It is recommended to use water as a lubricant when using these burrs. All burrs in this set have a shank size of " (3 mm), allowing them to be compatible with most die grinders and rotary tools as you shape, grind and finish your work with precision. When the job or project is complete, you'll be happy to place your burrs back into the compact storage case so you can store, organize, and transport this set for future use. 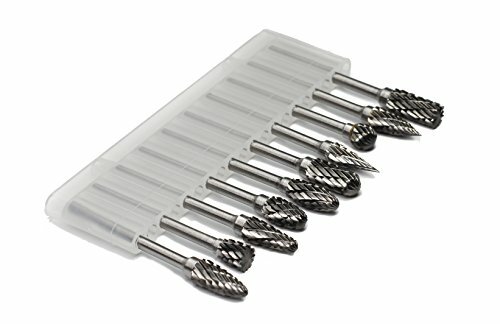 Works with mostly small rotary tools for DIY carving fans. 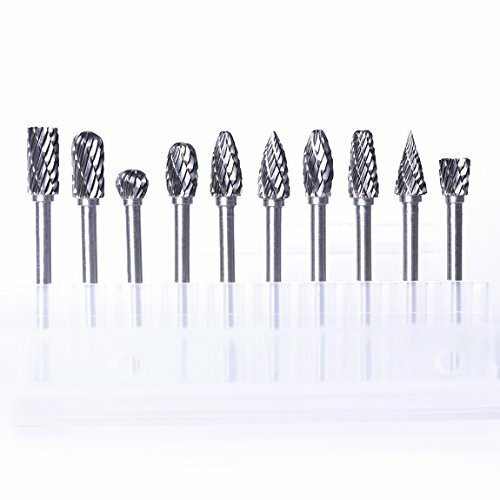 10pcs Tungsten steel solid carbide burrs for DIY enthusiast or hobby and craft fan, and give your rotary tool even more functionality with this set of diamond burrs. steel,stainless steel,hardened steel,copper aluminium etc. SA-5: Cylindrical shape 1/2" x 1"-1/4"Shank SA-3: Cylindrical shape 3/8" x 3/4"-1/4"Shank SC-1: Cylindrical radius end 1/4" x 5/8"-1/4" shank SC-3: Cylindrical radius end 3/8" x 3/4"-1/4" shank SD-1: Ball shape 1/4"X7/32"-1/4"shank. SD-3: Ball shape 3/8"X5/16"-1/4"shank. SF-3: Tree shaped radius end 3/8" x 3/4"-1/4"shank SF-5: Tree shaped radius end 1/2" x 1"-1/4"shank !!! Warm Tips!!! Flame shape, Investde cone, Cone shape, Taper sharp-radius. - Carbide rotary file is generally use with hand held electric or pneumatic tool drive, can also used in machine tool. - The speed of the electric or pneumatic tools is usually 6000-50000 revolutions per minute. - Can process all kinds of metal (including all sorts of hardened steel) and non-metal (such as marble, jade bone). - Suitable for deburring and polishing on cast iron, cast steel, carbon steel, alloy steel, stainless steel and other materials. - Excellent for fine detail work, cutting, engraving, carving, touch-up and finishing. - Made of heat-treated durable double cut carbide that lasts long working life. - Packed with nice plastic case for safety storage and protection. 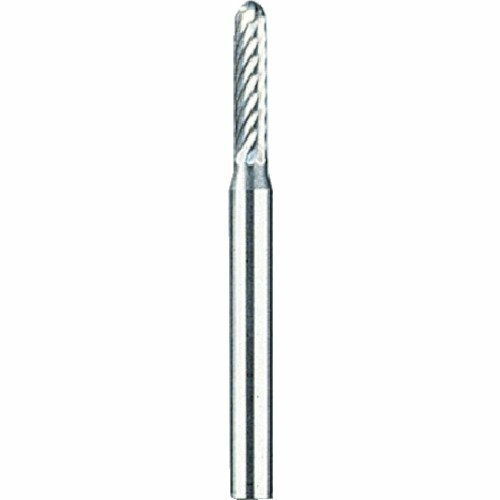 Carbide Die Grinder Bits Tungsten Carbide Use: Rotary Burr. Total length 45-50mm, cutting diameter 1/4 Inch(6mm), shank length 35mm, shank diameter 1/8 inch(3mm).carbide rotary burr set with 1 4-inch shank. Double Cut Design The groove lines of the head are crossed, more suitable for an object whose density is relatively low, such as wooden, plastic and aluminum. Long Service Life The service life of tungsten steel rotary burr is 10 times longer than high-speed steel and 200 times longer than grinding wheel. Adaptability 1/8 straight shank can be held by any rotary tool with three jaw chuck for accurate centering. A good choice of DIY carving, engraving, and polishing. 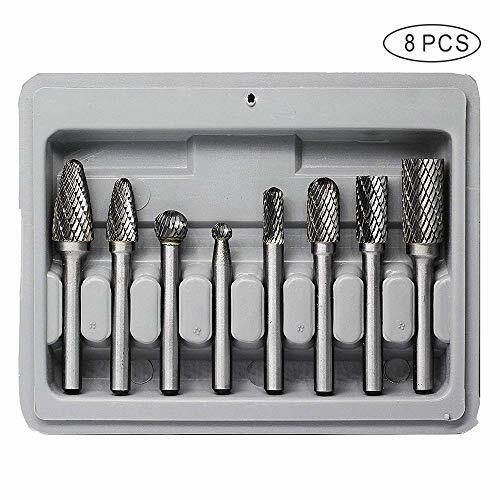 Suitable For Most Tools 10 pieces Double Cut Solid Carbide Rotary Burr Set carbide burr set, fits most small rotary tools,Woodworking Drilling Carving Engraving, making DIY carving fans much easier to do the wood working job. 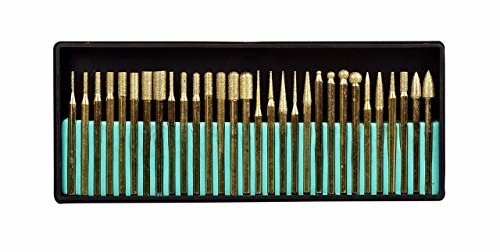 The JESTUOUS 20 Piece Double Cut Solid Carbide Rotary Burr Set includes 10 different type of assorted burrs. 1.Check the product when you receive it,any problem please feel free to contact us. 2.Remember to protect your eyes when working with the bits. Used with handheld electric or pneumatic tool drive,for Die Grinder, Dremmel Tool or Rotary Drill which can go along with 1/8" shank carbide burs. With tungsten carbide material ,sharp and sturdy,processing all kinds of metal and non-metal. For cast iron, cast steel, carbon steel, alloy steel, stainless steel,plastics,metal and other materials. Assorted shapes include: ball, cone, rounded cylinder, flat top cylinder. 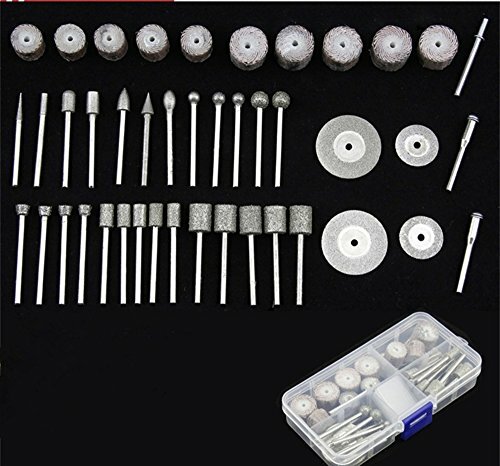 Carbide burr kits shank diameter:3mm(1/8 inch), Cutting edge diameter:3mm(1/8 inch),and 20pcs/set. bewidely used in machining iron, steel casting, carbon steel, alloy steel,stainless steel, hardened steel, copper aluminum etc. Having long life often times than high speed steel burrs and fifty times than small emery wheels. Finish machiningvarious kinds of die cavities. Removing the burrs ofthe castings, forgings and the welding spatter on the weld assemblies. Chamfering angle,circular bead or flute on the mechanical components. Grinding the hole toan accurate shape. burrs show their remarkable performance. Cutting speed should not exceed 35,000 RPM. Durable Made of heat-treated tungsten carbide YG8that lasts 10 times working life than HSS , suitable for machining variouskinds of metal material including HRC65 hardened steel. 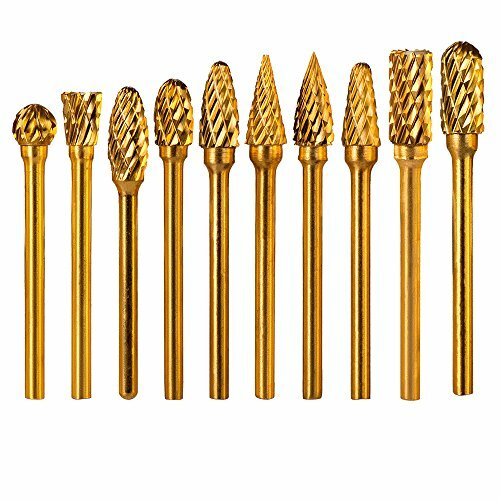 Versatile Widely used for metalwork, tool making, engineering,model engineering, wood carving, jewellery making, welding, chamferring,casting, deburring, grinding, cylinder head porting and sculpting. Target This is an essential bit for metalworker & DIYcarving fans, easy to grasp and use, safe and reliable. Packaging Packed with a transparent plastic tube for safety storageand protection. Feature: Processing all kinds of metal(including all sorts of hardened steel) and non-metal (such as marble, jade bone),machining hardness reach For the most work it can be replaced with small grinding wheel,and no dust pollution. Good machining quality,high degree of finish,can work out the high accuracy of various shapes mold cavity. Service life is long,10 times higher than the durability of high speed steel cutter,200 times more than the small wheel durability. Convenient control,using simple,safe and reliable,reduce labor intensity,improve the working environment. Carbide rotary file generally use with handheld electric or pneumatic tool drive (can also be used in machine tool).The speed of the electric or pneumatic tools usually is 6000-50000 revolutions per minute. Uses Cleaning trimming,veining and weld joint of casting, forging and weldment. Finishing all kinds of metal molds. Impeller passage of finishing processing. A variety of mechanical parts chamfer,round and groove processing. Inner hole surface of machinery parts finishing. The process of various metal and nonmetal sculpture. High quantity of stainless steel make sure the long service. 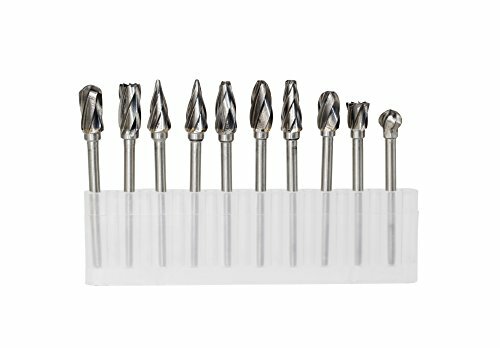 It is recommended to use water as a lubricant when using these burrs. 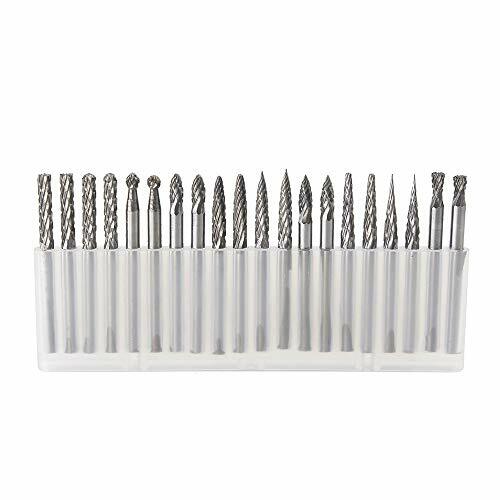 All burrs in this set have a shank size of " (3 mm), allowing them to be compatible with most die grinders and rotary tools as you shape, grind and finish your work with precision. When the job or project is complete, you'll be happy to place your burrs back into the compact storage case so you can store, organize, and transport this set for future use. High performance on processing Copper, Aluminum, Alloy, Iron, Marble, Jade, Steel, Glass, Wood and Plaster etc. Highly recommended for polishing metals and plastics, jewelers, lapidary use, hobbies, crafts, craft modeling, home repair and so much more. Tungsten Carbide Cutters are ideal for shaping, smoothing or removing material from especially hard materials. Shapes, smooth or grinds especially hard materials including: hardened steel, stainless steel, cast iron, nonferrous metals, fired ceramics, plastics and hard woods. Suggested RPM:25000-50000, Max RPM 70000. Metals with very little effort. All the tools set are well inspected before sending to our customers!